Obituary for Regina A. 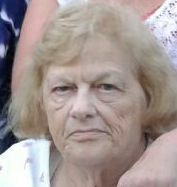 (Nonemaker) Showers | Rearick-Carpenter Funeral Home, Ltd.
Regina A. Showers, 78, of Jersey Shore, passed away, Sunday, April 7, 2019 at Manor Care South, Williamsport. She was born in Castanea, June 25, 1940, the daughter of the late Edward L., Sr. and Margaret (McKinney) Nonemaker. Regina married the love of her life, Richard E. Showers, June 2, 2001 and they shared 17 years of marriage. Earlier in her life she worked as an Aide at Susque-View, and then worked as a housekeeper for the Clinton County Court House in Lock Haven. Regina attended Crossroads Community Church, Jersey Shore. Regina loved animals especially cats and dogs. She would set up and work at local Flea Market alongside her father; she also enjoyed going with her sister, Cindy, and sitting with her at the Flea Markets. Regina is survived by her, husband, Richard, a stepson, Richard J. Showers, of South Williamsport, a stepdaughter, Kristan Keller, of Williamsport and five grandchildren. She is also survived by a brother, Edward Nonemaker, Jr. (Lottie) of Turbotville, two sisters, Cindy Dunlap, (Chuck), of Jersey Shore and Helen Griener, of Manheim. Regina was very close to all her nieces and nephews that survive her. A funeral service will be held, Saturday, April 13, 2019 at 11 am at Rearick Carpenter Funeral Home, 1002 Allegheny Street, Jersey Shore. In lieu of flowers, her family suggests memorial donations in Regina’s name be made to the Lycoming County SPCA, 2805 Reach Road, Williamsport, PA.